OK, I admit it. I do have a tendency to go on a bit, especially about wild food, foraging and all things connected. So, for this month I’m going to shut up and just give you some delicious new recipes to try, either created by me or generously donated by foraging friends. Actually when I say I’m going to shut up, that’s not strictly true but I will cut this introduction down to the briefest of paragraphs and hopefully let the recipes speak for themselves. February can be the hardest of months but with extra time indoors and still no shortage of amazing things to forage, it can also be one of the most productive. As with all my recipes, feel free to take massive liberties, exclude ingredients, add others and adjust quantities as you see fit. 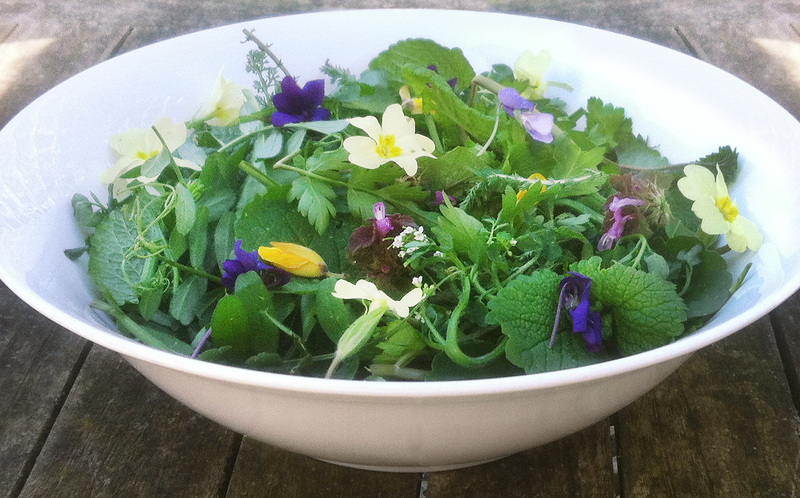 Happy experimenting and if all else fails you can just pick a wild winter salad like the one above. 1. 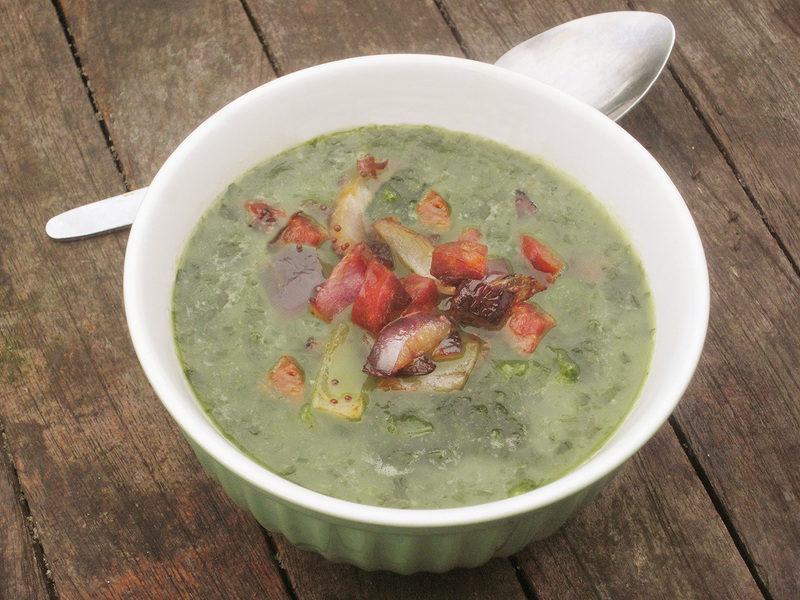 My Wild Garlic and Chorizo Soup. Invented, like so many of my recipes, by using what came to hand, this truly is a delicious and simple thing to prepare. I actually used the last of the previous seasons wild garlic, sweated and kept in the freezer for a year, but ideally use fresh Ramsons, 3 Cornered Leek or whatever you can get your hands on. I’d recommend about half a carrier bag full, washed and then sweated for a few minutes to reduce, whizzed in the blender for just a few seconds before adding to a litre of good stock, a decent slug of soy sauce and some black pepper, also a cubed and peeled potato if you want something a bit thicker. Cook this slowly for half an hour and while that’s happening, cut up some Chorizo into about 20-30 1cm cubes and fry them on their own for a minute or two to release lots of the oil. This oil I discard but it’s up to you, set the Chorizo aside then slowly fry a diced onion with a teaspoon of mustard seeds and when it’s soft add a teaspoon of brown sugar and carry on at a very low heat for another ten minutes or so (you can skip all this and just quick fry the onion if you prefer). Then the Chorizo goes back in the frying pan for a minute before the whole lot joins the soup mix for a few more minutes, keeping a little back to sit on top of the soup when you serve it. Also at this point, I add anything between a quarter and a full teaspoon of celery salt which really lifts the flavour. Wild Garlic and spicy sausage…what could be better? 2. 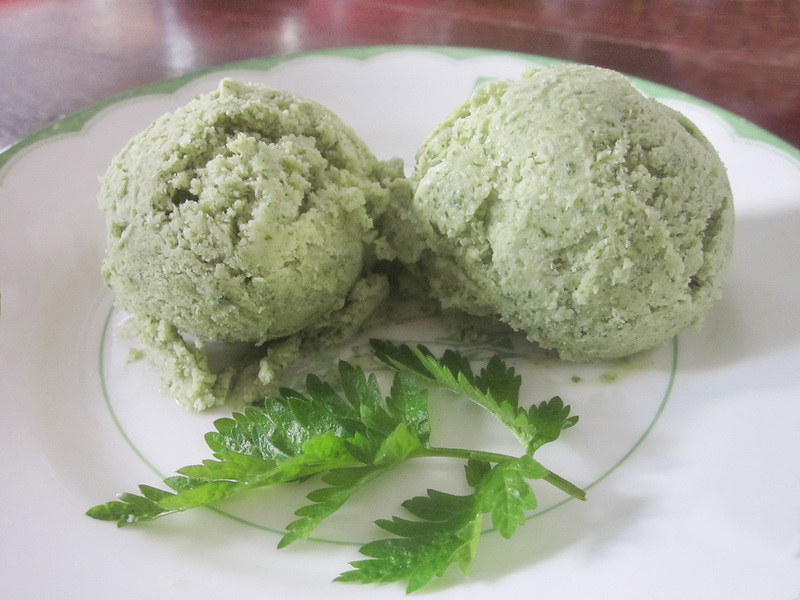 My Cow Parsley (Wild Chervil) Ice Cream. One of the ways I teach wild food ID is by getting everyone to hardwire certain plant smells into their brains. Take some foliage, fold it over, give it a good twist and sniff hard. When I do this exercise with Cow Parsley, mainly aimed at helping people avoid picking Poison Hemlock by mistake, the range of responses is always fascinating. It smells of lemons says one person, pears says another, it just smells green someone will always say. I have also had everything from carrots to varnish to, best of all, “it smells like hippies”…maybe they meant patchouli? Anyway, the point is, we are all wired differently, respond to different smells and tastes in numerous ways and there is basically no right or wrong, which leads me to believe that some people will love this recipe and others will think it tastes horrid. Either way, do be extremely cautious when picking and eating members of the carrot family and only consider making this if you are 100% sure of your ID. Hemlock ice cream would not only taste awful but possibly send you on a one way trip to the hospital. And so, on that cheery note, here’s the recipe and for the record, I think this is a wonderful tasting desert and I’m quite proud of it. Take enough Cow Parsley leaves to fill a pint glass, young stems are fine too but the softer the better, add 4-5 tbsp of caster sugar (less of honey, stevia or xylitol if you prefer) and just a dash of water, then blend together until you have a runny dark green paste. Mix this in a bowl with 400g of creme fraiche. Now take three egg whites and whisk for ages until they form “soft white peaks” and then fold this gently into the rest of the mixture. If you have an ice cream maker then you know what to do next, if not then put the mix in a plastic box in the freezer and give it a stir every forty minutes for the next few hours to avoid it crystallising. Maybe serve it with Peter’s cherry blossom syrup recipe. 3. Mark Williams’ Easter Ledge Pudding. The ingredients are : 400g pearl barley, 8 eggs, 2 large leeks, finely milled dried nori seaweed (optional), about half a carrier bag of washed dock and dandelion leaves – or any other spring green with a reasonably strong flavour such as nettle, a handful of any finely chopped aromatic wild herbs you fancy (optional) – cow parsley is really common at this time of year. 1. Boil the pearl barley until tender, drain and put a side to cool. 2. Hard boil 4 of the eggs and chop fine. 3. Chop the leeks fine and sauté in a bit oil until soft. 4. Blanch your half carrier bag of greens in boiling water for 20 seconds and refresh in iced (or very cold) water. 5. Thoroughly squeeze all the water out of the blanched greens and chop fine. 6. Mix the chopped eggs, leeks, barley, chopped greens, herbs& powdered seaweed together with 3 raw eggs. 7. Season very well with salt and pepper. 8. Place mixture in a large tray and wrap the tray really well in cling film and place in a larger tray of hot water (bain-marie). 9. Steam mixture for 45 – 60 minutes in the oven (160° C) or on the hob, well enough to be rolled into balls when it comes out. 10. Roll the mixture into small balls and then refrigerate. At this stage you can flour and fry them. 4. Peter Studzinski’s Cherry Blossom Syrup. More than a forager, Peter is a wild food advisor to some of the countries top chefs, their best kept secret, until now. I met Peter mushroom hunting a few years ago, common interests tend to bring nerds together and since then we’ve run events together, shared recipes, ideas on new ways to use traditional ingredients and generally put the world to rights whilst wandering the wood. This super simple idea, in some way sums up what wild food should be, delicious, easy, abundant. Peter says….”I’ve a love hate relationship with the fruit of wild cherry. There are many varieties, most are sour or have more stone than fruit and even if you’re lucky enough to find a sweet variety, birds often strip the trees before they ripen. However, there’s an alternative, simply leave the fruit for the birds and use the reliable and abundant Spring blossom. Cherry blossom syrup is popular in Japan and parts of Asia where it is produced commercially and it’s so delicious, I haven’t a clue why you rarely hear about it here. In fact using blossoms and flowers as a flavouring for syrups, jams, jellies, stocks etc is an area where there’s room for a lot of experimentation. 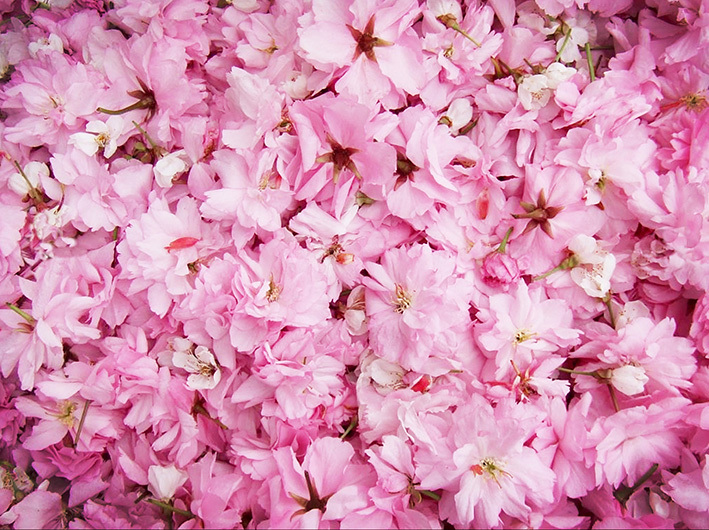 Cherry is one of the first spring blossoms, from early March until early May and all the of the UK varieties are suitable, even the ornamental varieties that do not produce fruit. In fact I prefer to use these and leave the fruit to the birds and find the more colour in the blossom the more colour in the syrup so you could say it’s best to use cherry with a nice, bright, pink blossom. Of course you need to know your trees, but with a little research it’s not that hard. 5. 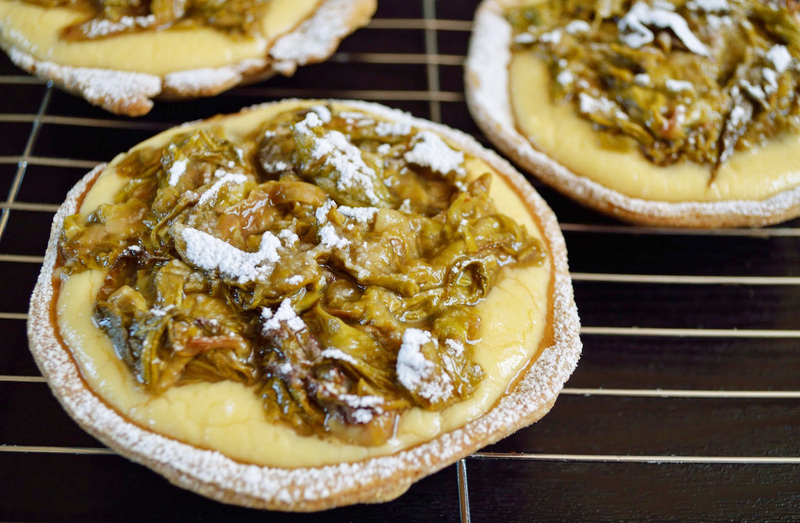 Craig Worrall’s Japanese Knotweed Tarts. And finally, as they say, an awesome 4 stage recipe from Craig at Edible Leeds, using this much hated but delicious plant, think Rhubarb meets lemon with the flavour turned up.…In the classic British gangster flick Get Carter, the hero Jack was strongly advised against “going up north”, apparently the people up their weren’t very friendly, well he obviously wasn’t off to meet Craig and go on one of his lovely wild food walks was he? I love this part of the world and spent many happy holidays in Yorkshire as a kid, fishing and exploring the dales. 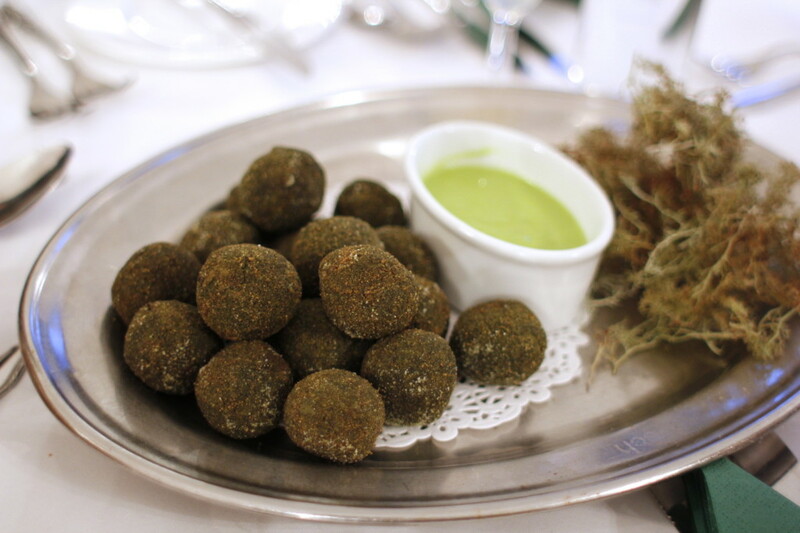 If that’s where you’re headed be sure to look at the events posted on https://edible-leeds.blogspot.co.uk Of this recipe, Craig says “I love the utilisation of a tasty, abundant ‘invasive’ species. The slightly tart acidity of the Knotweed combines really well in contrast to the creamy custard and buttery pastry”. So, here it is. 250g plain flour, 125g unsalted butter (cubed), 1 egg (beaten), 3 tsp caster sugar (add more if you like sweeter), a pinch of fine sea salt, up to 40ml cold milk (though you may not need this). Sieve the flour into a bowl. Add sugar and salt. Make a well (in flour), add the egg and butter mixing them together (it get’s lovely and sticky! ), and slowly start to mix in the flour. Add small quantities of milk (if required) until a firm dough forms. Roll into a ball, place in cling-film (pvc free) and put in the fridge for up to one hour. When ready to use, remove from the fridge, lightly dust a clean working surface & roll out to approx 3mm thick. Cut out into rounds approx 10cm in diameter and place each one individually into pre-buttered, non-stick bun baking trays (mine has room for four pastry bases at a time). Prick the bases with a fork and “blind bake” in a pre-heated oven at 180-190 degrees celsius for approx 8 mins, remove the blind baking beans/parchment paper and cook for a further 5-8 mins or until the pastry is cooked and lightly golden. Once satisfied with cooking remove from the oven and leave to cool. 200ml milk (I use full fat), 50ml double cream, 3 large free range egg yolks, 20g plain flour, 70g light soft brown sugar, 1 tsp good quality Vanilla extract (optional). Heat the milk and cream in a pan until just boiling (then take off of the heat). Meanwhile, whisk the egg yolks, flour and sugar in a bowl/large jug. Pour on the hot milk/cream and whisk together. Pour all the contents back into pan and heat gently, whisking continuously until it thickens. Remove from the heat and leave to cool (if you dust the surface with icing sugar it prevents a skin from forming). Take two/three large handfuls of fresh, young Japanese Knotweed shoots and chop. Add to a saucepan with the juice of one orange and sugar to taste (you may wish to add sugar once the knotweed has cooked down). Once cooked (approx 5-10 mins on a low gentle heat) remove from the heat and leave to cool. Take a pastry base, add the cooled creme patissiere, add the cooled japanese knotweed topping and dust with icing sugar. Tuck in and enjoy! If desired you can add a pinch of ground cinnamon to the Japanese Knotweed while it cooks down. Next post: Everything we need to know about foraging is in just one plant. Previous post: Crushing Colds and Vanquishing Viruses (Part 2).